In SEA product portfolio there are some special equipments suitable for industrial applications. Find below a brief description of them and their specific application field. 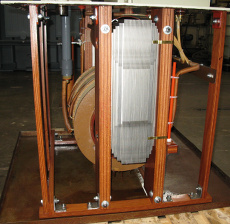 Special equipment where the magnetic field can be used for specific industrial applications. The photo is referred to an application where a magnetic field is used to guide metals for packaging. 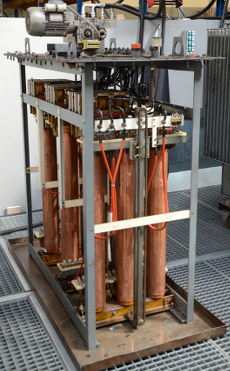 Such kind of transformers are used as testing equipment for different apparatus and devices. 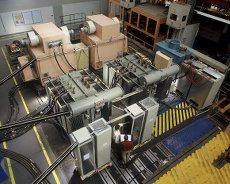 to test equipments (bushings, surge arresters, switchgears, etc.). 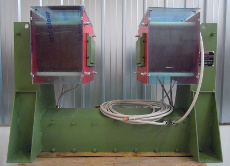 It is one of the currently used systems to remove the particulate from the exhaust smoke of power plants. The particles are removed from the electrode to allow the separation of new particles. Special equipment commonly used for voltage regulation required in furnace heavy industry application.